View Westward From Ghoosla Ghat, Benares. bl.uk > Online Gallery Home	> Online exhibitions	> Asia, Pacific and Africa Collections	> View Westward From Ghoosla Ghat, Benares. Plate 3 from the first part of James Prinsep's 'Benares Illustrated'. Prinsep (1799-1840), an antiquary and colonial administrator was assay master at the Benares Mint between 1820-30. The lithographs published in this collection were based on his original sketches of the various views of the 'holy' city of the Hindus. Of this view he wrote: 'The canopied Portico and Temple were built by Guhna Baee, a Marhatta lady, in honour of the Goddess Shunkuta Debee: there is a respectable attendance at the daily lectures at this shrine. 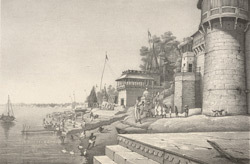 On the right is the house of Punditayun, the widow of Bisumbhar Pundit, a Vakeel or Envoy of Nagpoor, who obtained a valuable estate in the Benares district from the bounty of Mr. Hastings...Further on are situated the rich Dewula on Munikarnika Ghat; and on the river's edge are seen one or two Murhees- chambers into which the sick are removed when at the point of death, that their sins to the last moment of existence, may be washed away by the holy stream'.